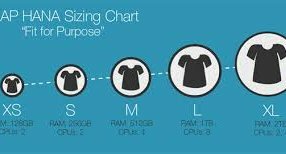 Hardware Sizing : H/W Sizing means determining the hardware requirements of an SAP System such as network bandwidth, physical memory, CPU power in SAPS, and I/O capacity. Which SAP system should be sized?. Which release should be the base for SAPS(SAP Application Performance Standards (SAPS)) entered or calculated?. Do you wish to display a high availability solution?. Do you plan for a 2-Tier or 3-Tier system?. Which server family for a two-tier system or the database-server would you like to size?. Growth Factor for this workload in Percentage. Reasonable values are between 10% and 100%. Shall the calculation be based on an input of SAPS (SAP Application Performance Standards (SAPS)) or USERS? Please enter SAPS or User number. Highest number of users who log on in parallel. Highest number of concurrent portal users per hour. How many clicks (in %) access Content Management. Low users– On average typically around 400 dialog steps (screen changes) are executed per week, which is equivalent to ten dialog steps an hour (assuming a work week of 40 hours) or every six minutes. Medium Users– On average typically around 4800 dialog steps (screen changes) are executed per week that is equivalent to 120 dialog steps an hour (assuming a work week of 40 hours) or every 30 seconds. High Users– On average typically around 14400 dialog steps (screen changes) are executed per week that is equivalent to 360 dialog steps an hour (assuming a work week of 40 hours) or every 10 seconds. **Dialog Steps : Every SAP R/3 screen is called a dialog step. **Note: User based sizing is recommended during implementation because the exact volume of transactions are not known and the number of users are determined on the early stages of implementation. SAP Application Performance Standards (SAPS) describe the throughput power of a given hardware configuration. It is a hardware independent unit that is derived from the business processes of SD (SALES and DISTRIBUTION) standard application benchmark. In detail, 100 SAPS are 2000 fully business processed SD order line items per hour or in more technical terms, 2400 SAP transactions or 6000 dialog steps (screen changes) per hour. The appropriate tests are done in a customer system with customer data. The disadvantage is that conducting these tests requires considerable time and money.